Ah yes, it’s that time of year again, the holiday season is officially upon us. Christmas music is playing in all the stores, Santas are appearing in every mall and hoards of people are clamoring to find the right gifts for their loved ones. With constraints on time and money it’s nearly impossible to buy thoughtful gifts for everyone on your list. Christmas cards provide a great and affordable way to show people that you’re thinking about them this holiday season, and it’s easy to add a personal touch to cards with a nice hand written message or by slipping in some family photos. The Christmas card has been a traditional holiday exchange for many years, but the origins of this beloved practice remain somewhat shrouded in mystery. 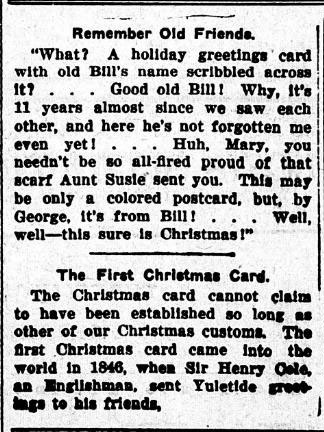 According to an article from The Bourbon news, the first Christmas card can be attributed to three different men. 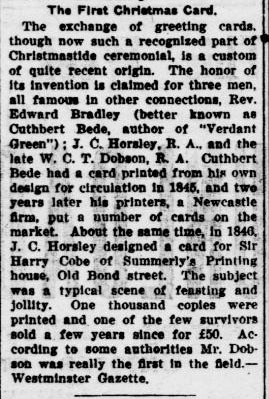 But in a separate article from the Warren Sheaf, (from Warren, Marshall County, Minn.), only one man is credited with this holiday invention. So who had it right? Well it seems all three publications got it partially right. According to György Buday’s book, The history of the Christmas card, the first Christmas card was designed by John Callcott Horsley, (JC Horsley), in 1843 at the request of Sir Henry Cole. In London, two batches of cards were made available, totally 2,050 cards sold for a shilling each. 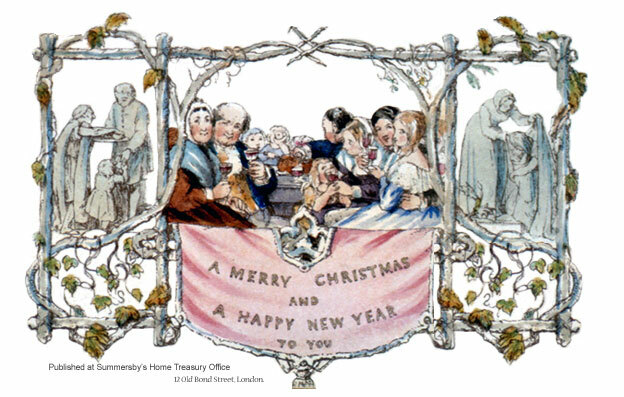 The first Christmas card showed a family enjoying a holiday dinner, with a greeting for the receiver to have a “Merry Christmas and Happy New Year” Image is in the public domain. In 1875 Louis Prang became the first printer to offer cards in America. 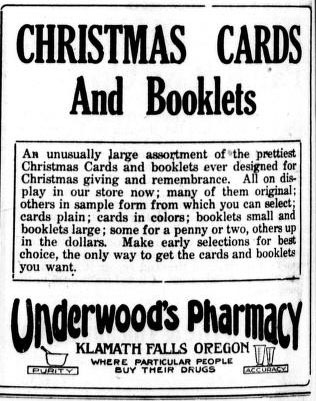 Here’s an ad for Christmas card booklets from The Evening Herald in Klamath Falls, OR. So when you’re out shopping for the perfect gifts, remember that Christmas cards are a great way to show someone that you’re thinking of them this holiday season. Season’s Greetings from all of us at the Oregon Digital Newspaper Program!